If you have an RV or boat, you know that it can be a hassle trying to find a spot at home to keep it. At AA Self Storage, we have the answer. Conveniently located near Brunswick Forest, our Leland, NC storage facility offers boat and RV storage units. Fully paved facility with covered parking available. Covered parking protects your vehicle from the elements to protect against sun damage, fading, rain, dirt, and debris. Covered parking is rated for 130 MPH winds. All covered parking spaces have electrical hookups with a monthly fee based on type of usage. We also have a wash down station. Our property is fully fenced and well lit. We have 24 hour digital surveillance. Our secure gate access allows you to enter with your own gate code and records all vehicle entries each day. We have a manager on-site able to be reached if any emergency situation arises. 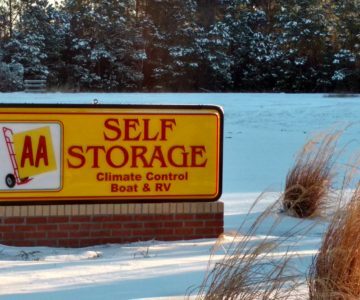 Call AA Self Storage today to learn more about our boat and RV storage units.